Happy Friday! 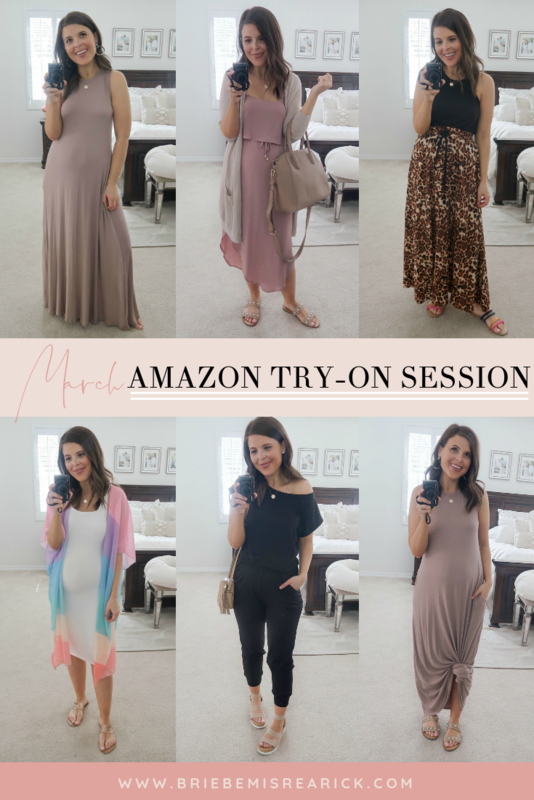 I had such good luck with my last few clothing orders on Amazon that I decided to round up all of my favorites for you today. The best part is that all of the items are non-maternity but also work great for a growing bump. I was 22.5 weeks pregnant when I took these photos to give you an idea of how they’ll look during pregnancy. Most of the items are available on Amazon Prime which means free 2-day shipping if you have Prime! You can head over to my Instagram stories where I’m doing a try-on session as well to see how all of the items look on video. White Bodycon Dress (non-maternity) : This dress is seriously so comfy! It’s made of the softest/stretchiest material and perfect for a growing bump. I sized up one size and am wearing a medium. It comes in 11 colors and is under $20! The white is slightly sheer but it personally didn’t bother me. 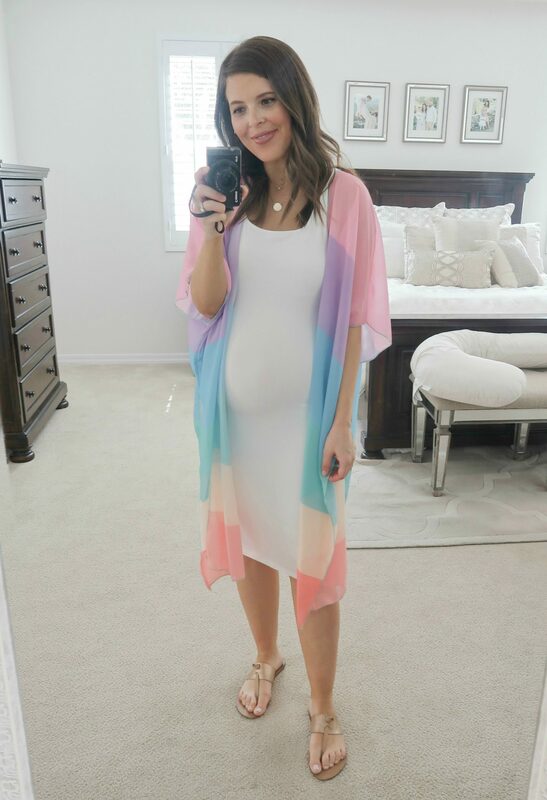 Rainbow Stripe Kimono (non-maternity) : I absolutely LOVE this kimono! The colors are so perfect for spring/summer. We have a beach vacation planned in a few weeks and I can’t wait to wear it over my swimsuit! It’s also under $20 and comes in 17 different prints. 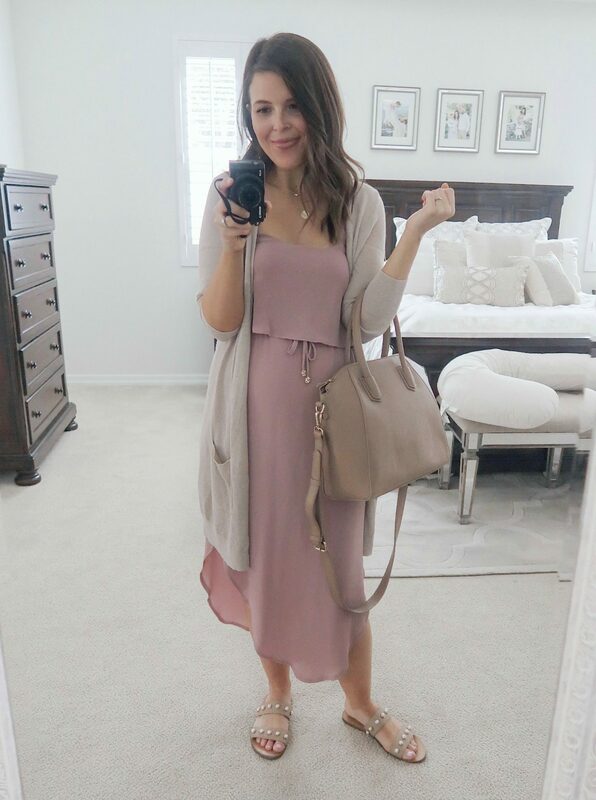 Mauve Midi Dress (non-maternity) : This is such a cute dress for spring/summer and can easily be dressed up or down. I’ve seen several bloggers who aren’t pregnant wearing it and it looks so cute either way! It’s $22.99 and comes in 12 colors. I plan on getting the ‘dark yellow’ and ‘sunset glow’ ones too! I sized up one size and am wearing a medium. Black Casual Off-the-Shoulder Short Sleeve Jumpsuit (non-maternity) : You may have seen me post this on Instagram earlier this week. I declared it my favorite clothing item of 2019 so far and I totally wasn’t kidding! It’s so comfy and flattering and I know I’ll be wearing it all the time after giving birth too. It’s only $21.99 and comes in 6 colors. I sized up one size and am wearing a medium. 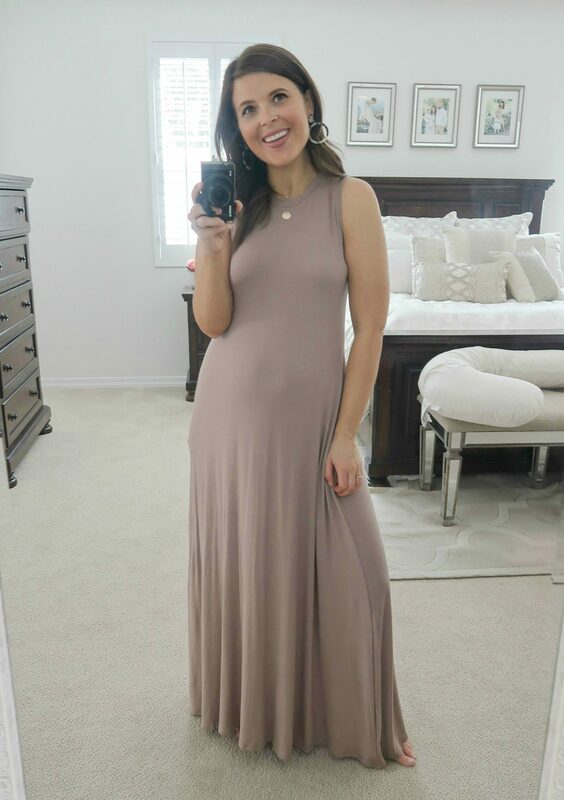 Taupe Sleeveless Maxi Dress with Pockets (non-maternity) : I love how this dress can be worn two different ways! Oh, and it even has pockets! I styled it with one of my favorite pairs of earrings which are also available on Amazon for just $8.99. My dress is $19.99 and comes in 19 colors! 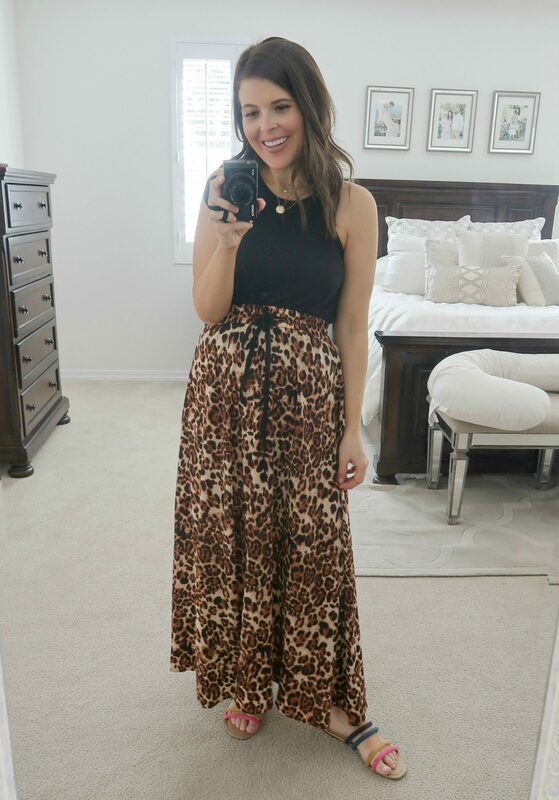 Leopard High-Waisted Maxi Skirt (non-maternity) : I knew this skirt was a win when I walked into my sister’s house and she told me my outfit was so cute! If there’s anyone who’s always honest with me (sometimes brutally, lol) it’s my sister! But hey, that’s what sisters are for right?? My skirt is $20.98 and I sized up to a medium for the bump. Previous Post Baby Rearick #2 Gender Reveal! Hello- Cute clothes…how tall are you? I’m trying to decide what size in the leopard skirt. Thank you.